AFRICA has its rich men and women, multi-millionaires and billionaires. But sadly the lives of these illustrious sons and daughters of Africa have not been extensively documented. Inspirational literature on how to make it, to get that desired breakthrough is full of white figures like Richard Branson and the abrasive Donald Trump, who will probably be penning more of the books now that he is President of the United States. Africa’s young have been forced to look up to Western business ‘heroes’, many who have made their riches exploiting Africa, for inspiration. And that is what made a little but powerful book I happened upon as I sought literature on how to make it, written from an African perspective, an enchanting experience. 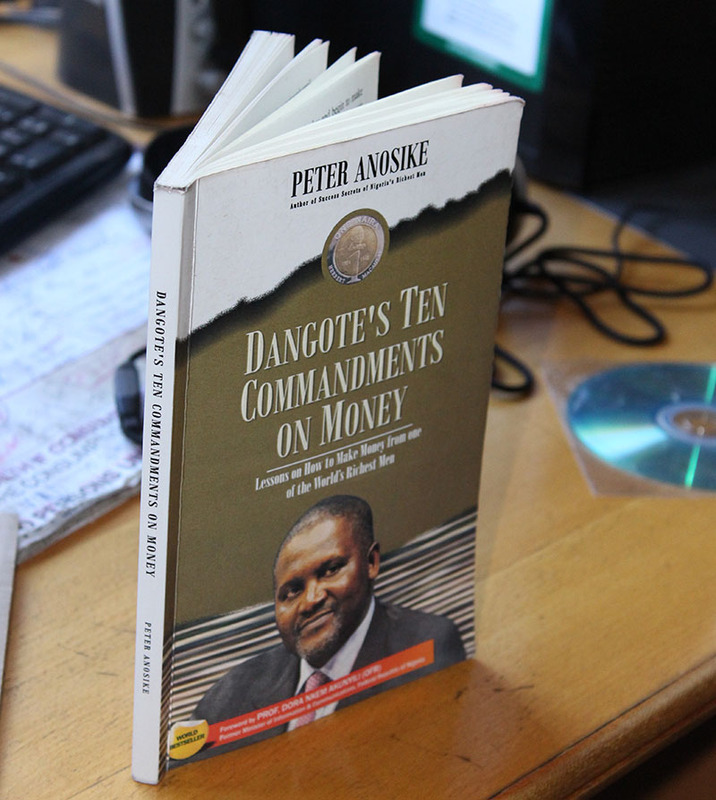 The book, Dangote’s Ten Commandments on Money, Lessons on How to Make Money from one of the World’s Richest Men by Peter Anosike, is an insightful and valuable piece of literature. Dangote raised himself by the bootstraps to become a giant respected not just on the continent but across the world. His is a life and a story that stands to benefit every African with an entrepreneurial spirit. “When the word ‘entrepreneurship’ is mentioned, one name that readily comes to mind is Alhaji Aliko Dangote. To borrow a well-known saying, Dangote bestrides the business environment like a colossus. From consumables to cement, logistics, real estate and many more, Dangote has spread his tentacles far beyond the shores of Nigeria. As I write, the Dangote Group has 13 subsidiaries spread all over Nigeria and operates in over 14 African countries. But Dangote is not just a continental player, he is also active in other countries across the globe, examples being China, Dubai, Gilbratar and London, with India and other key economies also on his radar,” writes former Nigerian Minister of Information and Communication, Professor Dora Nkem Akunyili, in the foreword. The book is an effort where Anosike creatively weaves a story in which Dangote is cast ‘in the mould of a benevolent mentor…(who takes) a bright youngster from an underprivileged background under his wings, teaching him how to succeed in business and supervising his business activities to ensure success’. The young man, Mike, is taken through the paces of starting and growing a business venture. What comes out clearly in the book is that there are no shortcuts to creating a thriving business. The character of the would-be businessman or woman is critical to success. “Before deciding on the business you want to go into, take time to examine yourself. “The type of a person you are will determine the type of business you should go into… Some people when they want to go into business tend to look out for the business that is doing very well at that material time and then go into it. But what they do not know is that it is passion that drives business,” expounds Dangote to his mentee. With the numerous economic empowerment programmes initiated by Government and availed opportunities, the book is a must read. It is a blueprint for those seeking financial independence. The book highlights the importance of respecting small beginnings. Many of us have shunned starting small, preferring grand entrances in the various sectors of business and this has led to many businesses collapsing before they have taken off. “In going into business, your background, personality or educational attainments do not matter. What counts is, is the business legal and is there money to be made from it? Once the business is legal and there is money to be made from it, then it does not matter whether the business is small or not. “Ego or pride has ruined a lot of people. Instead of starting small, they would want to start in a very big way,” explains Dangote to his student. The billionaire cautions his student on the dangers of greed and the need to be patient. A sustainable business that generates lasting wealth is built over time. “Our perception of business is profit, profit and profit. Nobody is interested in growing his or her business. We will go into business in the morning and expect to begin to make profit in the afternoon…it takes a minimum of five years before you expect profit from your business…if the business survives the first three years, it can hardly go under,” advises Dangote. The billionaire advises his mentee to be humane in business dealings. The book is a must read as it is full of enriching nuggets.